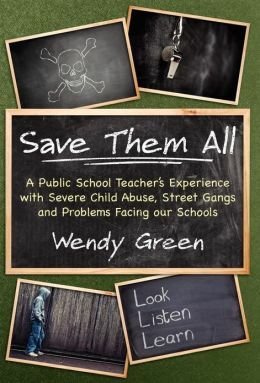 Just wanted to share Save Them All by Wendy Green,a non-fiction novel written by a woman who taught in some of California’s toughest schools. It’s an interesting story about life on the education front working with troubled kids for those of you who are interested in this subject. This entry was posted in Uncategorized and tagged California, education, gangs, Save Them All, schools, teachers, teaching, Wendy Green. Bookmark the permalink. I always like reading books on this subject – thanks for the recommendation! Thank you for your comment Letizia! As far as I’m concerned, education in the U.S. needs all the attention it can get!